I was diagnosed with Multiple Sclerosis (MS) in October 1998, when I was 18 years old. I am 37 now and blessed to say that my current condition is “stable”. MS is known as the “invisible illness” as symptoms vary from patient to patient. Intermittent symptoms both visible and invisible include: fatigue, balance, gait, unsteady walking, fine motor control fingers, pain, numbness & tingling feeling, bladder & bowel control, heat sensitivity, memory & cognitive issues, depression, speech & vision impairment, trouble with swallowing, and other neurological symptoms that affect mobility. I have “Relapsing-Remitting MS.” MS is when one’s immune system attacks the brain/spine also known as the Central Nervous System (CNS). These symptoms may arise at unpredictable times and can be severe when an “attack” (exacerbation) triggers. Unfortunately, there is no known cause or cure for MS, but the medication I am currently taking (Avonex Auto-Injector Pen – Interferon beta-1a) slows down the progression of the disease. This is one of the main reasons why I sought yoga in the first place, because of my MS… but to also center and balance my mind, body, and spirit. I’ve been practicing yoga for 8 years and been teaching for 4 years now. Thank goodness at the present moment, I am currently stable, but between the ages of 18-23 years, I was in severely bad shape that had me in a wheelchair, a walker, and the use of cane. It is a blessing that I have fully regained my mobility and ability to walk, and therefore practicing yoga as an able-bodied person would. I am hoping this status will remain as I move towards my 40s! Yoga for people with MS can be such a powerful tool. There are many benefits to be gained from practicing gentle hatha yoga, especially the asanas (or poses) that can be taught in a restorative series, wheelchair series, chair series, seated postures, seated/floor series, and through pranayama (breathing) and relaxation. This can assist with reducing fatigue, improving range of motion, improving spasticity, increasing strength, increasing coordination and balance, assisting in a patient’s confidence and calmness, as well as slowly beginning to advance with more postures specifically tailored to each student. Some of these gains could also be increased motility for digestion, increased circulation, and in many cases, significant relief from the depression that often accompanies the symptoms of MS. Yoga is not a cure for MS. I am not cured, but having my own yoga practice has certainly enabled me to handle my MS in a much more effective manner than before, and has enabled me to maintain a life that sometimes surprises me. 1. Fishman, MD, Loren M. & Small, Eric L. – Yoga and Multiple Sclerosis: A Journey to Health and Healing. New York, NY: Demos Medical Publishing, 2007. 2. verywell: Why You Should Be Practicing Yoga for MS – Why You Should Try Yoga.https://www.verywell.com/multiple-sclerosis-yoga-benefits-2440635 © 2016 verywell. All rights reserved. Kristine “Muktidevi” Demafeliz is a born and raised San Franciscan. She graduated from the yoga teacher training program the Integral Yoga® Institute in the heart of San Francisco in 2014. She received the spiritual Sanskrit name Muktidevi… which translates “Goddess of Liberation” that reminds her every day to remain “grounded” in her life, and to maintain her true nature of peace. She taught and subbed yoga classes at the SFO Airport for 3 years when she was employed there. 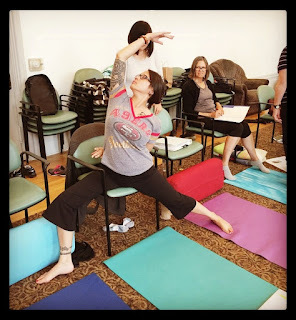 She offered classes to Airport Commission employees and Police Officers during lunchtime called “SFO YOGA®” She discovered a DEEP passion for yoga and has been a practitioner for 8 years. Muktidevi has also been living with Multiple Sclerosis (MS) for the past 19 years and says that the benefits of yoga have helped her tremendously on more than just a physical level but also with her mind, spirit, and heart. Her intention is to assist individuals with injuries, health ailments, and/or illnesses to bring awareness to one’s unique Self.